Hector Alvarez tends to his bees, which he calls his daughters. Hector Alvarez stands behind a table at a Sonoma County farmer’s market on a recent Saturday morning, offering the bounty of his bees. Spread in front of him are jars of wildflower honey, squeeze-bottle honey bears, honey sticks in sour grape and pink lemonade flavors, “creamed” cinnamon honey, containers of bee pollen, oozing chunks of honeycomb and elegantly tapered beeswax candles. His customers spend more than $500 on honey and candles that day. Mr. Alvarez is the founder of Hector’s Honey, based on a 2-acre farm in the tiny hamlet of Fulton, Calif. It has won gold medals and best-of-show ribbons at the annual Sonoma County Harvest Fair and is sought out by connoisseurs who crave its delicate sweetness. “It has a nice floral flavor that goes well with cheeses,” says Andrew Di Clementi, a pastry chef at the acclaimed Dry Creek Kitchen in nearby Healdsburg, who buys honeycomb from Hector’s. Mr. Alvarez is a leader in the growing artisanal food movement, teaching and mentoring other beekeepers on how to produce honey naturally, with minimum exposure to pesticides. It’s increasingly an issue in the face of what is known as “colony collapse disorder”—the sudden disappearance of honeybee colonies, which researchers have now linked to the use of pesticides and mite infections. Mr. Alvarez says he lost about 20% of his beehives in recent years because of this. 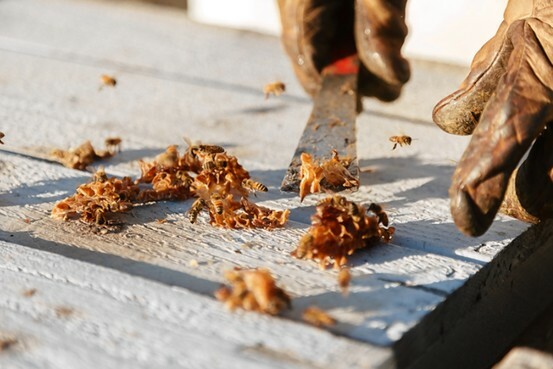 Hector Alvarez uses a tool to open the beehives inside their wooden frame, above. He moves the pallets with the hives on his flatbed truck at least three times a year to give the bees fresh nectar—shifting them from fields of flowering almond trees to blackberry bushes to star nettle to lavender. That ultimately gives the honey better flavor, he says. 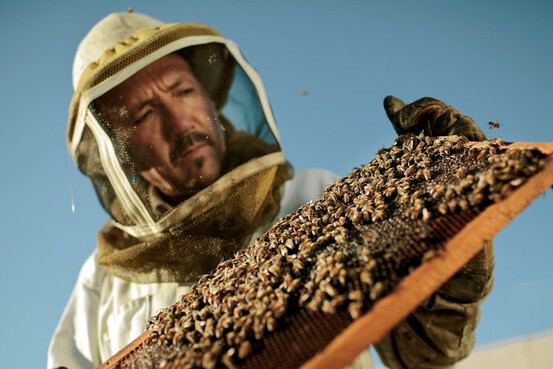 A third-generation beekeeper, Mr. Alvarez’s life has long revolved around honey. His grandfather and his father both kept bees in Mexico to make honey for the family. Later, working in California’s fields as a seasonal laborer, his father kept a few beehives in the U.S. as well. Arriving as an undocumented 15-year-old, Mr. Alvarez, 44, is now a naturalized citizen who has gradually transformed his family’s hobby into a thriving business. Mr. Alvarez now tends between 600 and 700 hives, which produce more than 15,000 pounds of honey a year. He starts new hives in small, temporary wooden boxes that he calls “nooks.” He raises the queen of each hive in a separate box, then introduces her into the nook. Eventually he moves the growing hive into a larger structure. He prefers Italian bees, since they are the most productive and gentle, he says, and Carniolan bees, which are the healthiest during the difficult winter months. Mr. Alvarez refers to the bees as his daughters, or, because his first language is Spanish, his “hijas.” “I feel like I raise them from the very beginning,” he says. Part of his job is playing chauffeur to his bees. As a teenager, Mr. Alvarez joined the Sonoma County Beekeepers’ Association and learned that local farmers would pay beekeepers to pollinate their crops for them. He acted on that tip and soon began getting paid for bringing his hives to fields and orchards throughout Northern California. Unlike many commercial beekeepers, Mr. Alvarez says he does not feed his bee colonies sugar syrups or artificial pollen. “I want them to naturally feed themselves from the flowers,” he says. To help control mites in the bees, he uses a natural product based on thyme oil. The health of the queen determines the productivity of the colony. Since most queens only live two or three years, one of Mr. Alvarez’s challenges is to replace them before their colonies slow down too much. He occasionally buys queens from outside suppliers to introduce genetic diversity into his hives, but generally he raises them himself. When he does have to replace them, he wears his beekeeper’s veil, gloves, a long-sleeved shirt and long pants to prevent stings. He also uses a device that releases smoke to calm them down. He can’t remember the last time he got stung. Finally, he extracts the honey from the hives in a small, richly scented “honey house” behind his home. Mr. Alvarez has been selling his products at Whole Foods Market WFM +1.23% and local groceries for many years. He also sets up his stand at as many as 11 local farmers’ markets a week, helped by his wife and his daughters. His big plan this year is to build a farm stand on a 14-acre former chive farm he bought in 2011, where he can sell honey, candles and farm produce on his own. Other than that, he says, he wants to make sure his “hijas” stay healthy.